What could be nicer on the last day of the year than to introduce a couple of people to shorebird watching by kayak. It was great to have your company Moyra and Anton. Anton, btw, is an enthusiastic 11 year old and it was a pleasure to have him out with us. A big thanks to Neil and Kel for bringing down their second kayak. The weather was warm and sunny but the wind was quite strong and made paddling a test of strength on the return trip. It was an extra high tide and the birds were left with little or no standing room. Added to this were three different raptors that flew over and set them all up in flight. The raptors were an Osprey, a Kite, and a juvenile White-breasted Sea-Eagle. The only birds that stayed unexcited were a couple of Pied Oystercatchers and a few Godwits that were not sure if they should be up there whirling with the rest of their flock or taking it easy down on the ground. I hope that 2010 is a good year for all and I wish you many great birding moments in the new year. The rain finally arrived and the grass is looking green again. I hope the trees and palms start to look better soon too. Over the last 3 days we have had 7mm, 25mm, and 10mm. This is not heavy rain which can often be 50-75mm in one day but it is certainly enough to start things growing again. It's very welcome indeed! Over the last few days one of the callistemons has started flowering and it has attracted a number of honeyeaters. This is a Little Friarbird and I think a juvenile. 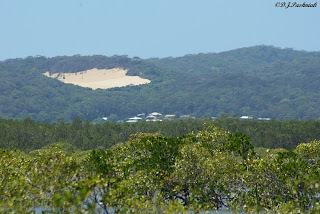 The Great Sandy National Park is just east of where I live and stretches from Rainbow Beach south to the Noosa area. Most of the park is only accessible with a 4-wheel drive vehicle. As I drive to Rainbow Beach I often look at the park and wonder what is just out of sight over the hills. However, on Thursday I was lucky enough to be taken on a tour of part of the park with friends who have a vehicle capable of managing the roughest and sandiest parts of the tracks! Thanks Sarah and Graham. It was a great day! 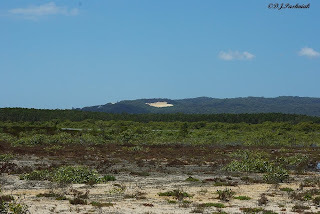 We drove along the Rainbow Beach road and turned off on the Kings Bore Track. (Marked 1) At Camp Milo we took the right fork of the road. Usually this is behind a locked gate but the gates were open on both ends of the track. The gates are solid and appear to be how Park rangers stop some portions from becoming too degraded with all the traffic. Penalties are big enough to deter most I think -although you'd have to get caught first! We saw people with dogs - and those are not allowed in the park either! This part of the park has much bigger trees than what is now left around the towns. Frankis Gulch is at the bottom of a very steep sided gully. Even with so little rain recently the little stream still had a good flow in it. The way the light falls depends on how much water you can actually see. The white sand on the bottom of the stream makes it hard to even see water - the stream was at least knee deep everywhere. The track crosses the stream on a small bridge just above where we were standing. Next stop was Lake Cooloomera. Reed beds completely surround the lake and it wasn't possible to get anywhere near the water. I could hear birds and see some swimming on the lake quite a distance away. The only photos were for ID only. The birds were ID'd for me as Australasian Grebes. After this we took tracks east and then north - a much longer route back to the main road. The track climbed steeply up through some very sandy sections and then wound around on ridges until we finally dropped down again close to the main road. Again, the trees were beautiful. Some had such twisted trunks and branches. The rainforest was thick down in the gullies and a few remnant stumps showed how huge the forest must have been before it was logged out sometime in the late 1800s. This is a huge clump of Elkhorns and there are more spreading down the trunk of the tree. These gum trees had recently shed their old bark and the new color was beautiful against the blue sky. Back out on the main road we turned south until we came to the Cooloola Way track (marked 2). It's down here and off on a side track that I saw Ground Parrots a year ago. I wanted to see how badly the recent fires had damaged the area. One side of the road had been completely burnt out but the other still had thick scrub. I hope the parrots had time to get out onto this other side! Further south we came to the bridge which crosses the Noosa River - a narrow one-way bridge and a very small stream at this point. We went down the bank where the track used to ford the stream and sat and ate our lunch. Most enjoyable! I really don't want a 4-wheel drive vehicle of my own! Too Big! Costs too much! Uses too much fuel! BUT I certainly wish there was more access into different areas of the park. Black and White - Birds. 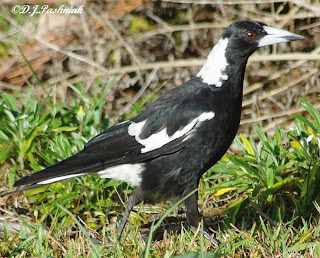 I thought it might be interesting to post photos of two of our most common black and white birds - the Australian Magpie and the Magpie-lark which is often called the Pee-wee because of its call. 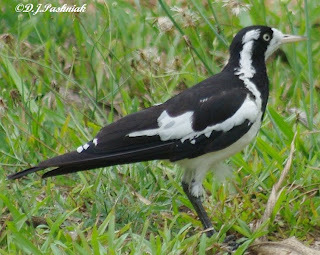 The Magpie is bigger than the Magpie-lark (34-44cm compared with 27cm). I seldom see Magpies in my yard. I know they are around but just not in the yard. In contrast the Magpie-larks are constantly here. They raised some young ones quite close to here and the young ones followed the parent birds around for weeks! They are so very noisy! Season's Greetings to all. I hope your Christmas day is as perfect as this one was for us a few years back. I scanned this picture in from a 'pre-digital' photo. 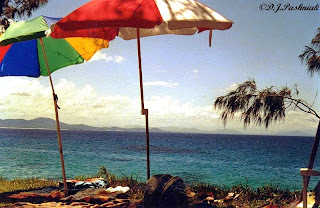 We spent the morning around in the bay swimming and wind surfing then came around to this beautiful spot and set up lunch under the shade of the umbrellas and some casuarina trees. This is at Arakoon on the mid-north coast of New South Wales. 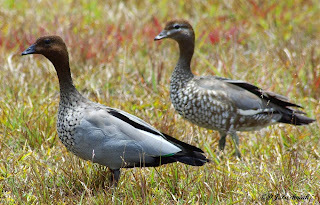 This post is because I have recently been seeing photos of Wood Ducks from the northern part of the world and I just wanted to show what "OUR" Wood Ducks look like. The male is on the left of the photo and the female on the right. I have just come back from a great morning out at what the QWSG calls the "Carlo Island Complex Roost". We tried to survey this roost by kayak last time but got into the mangroves in the centre and couldn't find a way through. This time thanks to Neil and Kel and family we went in by 4 wheel drive to the northern side of the roost. The track in was narrow and in a normal season would be very wet and boggy. Because we have had so little rain for the last 5 months today it was quite dry. There had also been a lot of quite large trees blown down over the track but someone had fairly recently cut and moved enough so you could drive in. The track ends right on the edge of the sand. 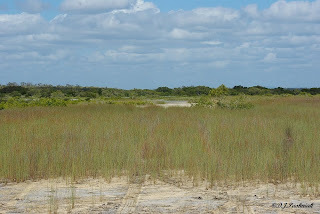 Immediately ahead is an area of sand, saltmarsh, sedges, and then mangroves fringing the deeper channels of water. Click on the images to enlarge. Looking south-east the sand blow above Rainbow Beach is easy to see and a closer view shows some of the houses also. There was no noise of traffic or boats today. The only sounds were from little bush creatures and birds calling. We were there about an hour before high tide. The area is so low that the tide quickly covered the sand and flooded around the low-growing plants. This site is huge and very complex. When we first got there we couldn't see any large roosting shorebirds but as the tide came in they flew up in huge flocks and whirled off over the mangroves. From our trip out in the kayaks the other week it is possible that some of the Godwits might roost with the Whimbrels in the mangroves but this would hardly be likely for the Eastern Curlew. We could not see any place where the Eastern Curlew were coming in to roost but we think there must be some sand banks further out in the bay - perhaps near Carlo Island - where they roost on the higher tides. We had heard Red-capped Plover as soon as we stepped out onto the sand. As the tide came in we found a large flock of Red-capped Plover and Red-necked Stint standing in the water and among the saltmarsh plants. I am leaving it to Neil to tell in detail about the birds we saw and the numbers that Kel counted. Kel is very experienced in counting birds so when he is with us Neil and I can just get on with taking photos! Go over to Neil's blog for the rest of the story. I was out at Inskip Point this afternoon around low tide - approx. 2p.m. There were huge numbers of Terns roosting out on the sand bank. I saw 3 major parts to the roosting flock. I only got one wide view photo of one of these - the first photo. The second photo shows a closer view of a second part of the flock, and the last photo was taken when part of the flock flew then landed again close by. I estimated that several thousand birds were there. The major part of any flock of terns can only be counted late in the afternoon and into the early evening when most birds fly in from where they have been feeding out at sea - so there would be many more coming in tonight. There were Crested Terns, Common Terns, Little Terns, and White-winged Black Terns in the flock. Some of these Terns will possibly stay here for the summer but most will migrate further south. All photos can be clicked on to enlarge. There was an early high tide this morning and almost no wind - perfect conditions for a kayak. I decided to search for birds which have been flying off from a roost before I can either get a good view or count them. First - because I am putting this post up on the Bird Photography Weekly Website I will post a photo of the only shorebird I got close to this morning - a Grey-tailed Tattler. Now for some details and scenic photos of my kayak trip. 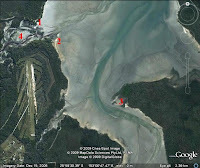 I am first posting an image from Google Earth where I have marked the points where I kayaked. Google Earth makes this easy by allowing you to save the image you are viewing as a jpg image. All images can be clicked on and enlarged. (1.) I set off from the Mullens Creek Picnic area and paddled out to the area we know as the "Airport Roost" (2.) However, before I even got that far a flock of Grey-tailed Tattlers had flown overhead and disappeared up into the Mullens Creek area. We haven't yet found out what is frightening off all the birds from this roost this year. The "Airport" roost only had a couple of Pied Oystercatchers left roosting on the sand so I set off for the other side of the bay. (3.) It is quite a distance across here - I estimate about 1 1/2 Kms - but a pleasant paddle with calm conditions. From this point you can look further south to the Carland Creek area which is the most southerly portion of the Great Sandy Strait. I have previously found birds roosting along the sand spit here but this morning there was nothing to be seen. I pulled the kayak up on the sand and walked behind the front line of mangroves and found a bigger area than I had expected. Most of it was very low lying and partly covered with the tide although there were several more sand spits intersecting the area. 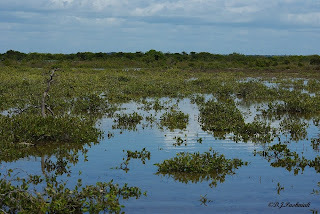 It was all more or less covered with different kinds of mangroves. 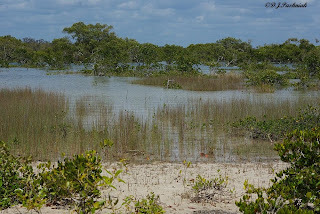 I was wandering around and watching the Mangrove Honeyeaters which were flying around when I heard a soft call and recognized the call of Terek Sandpipers. These were the birds I had hoped to find. They were well hidden among the mangroves and I doubt that I would have seen them without first hearing them call. However, they obviously could see me and I had time to get one photo - good enough only for ID - before they flew off. I counted about 40-50 birds. This is the only part of the Southern Great Sandy Strait where I have seen these birds. I paddled back across the bay and then up into Mullens Creek (4.) which is another area filled with mangroves. 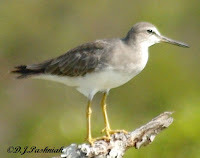 Once again I heard birds before I saw them - this time Grey-tailed Tattlers. They were roosting in mangrove trees which had very open branches to give them a good view of whatever was around. I counted 30+birds. 70-80 total birds is not a huge number for this roost and not as many as we have counted on previous years. Now that I know for sure where the birds are flying off to I will need to repeat this same kayak trip in another few weeks. ...than an early morning walk along the bay? Although it was overcast it still didn't look like rain, unfortunately. The light on the water was beautiful. The shorebirds were across the far side of the roost. It was still quite a way off high tide so they were still flying in as I was walking back. When there is a lot of sand exposed as there was this morning the larger birds (mainly Godwits and Eastern Curlews) tend to roost by themselves and the smaller ones (Red-necked Stint, and Lesser and Greater Sand-Plovers) by themselves. The only ones I saw on my side of the water were Red-capped Plovers and Red-necked Stint. These Red-necked Stint let me get quite close before they moved at all. The photos show the bubbles that come up out of the sand whenever the tide comes in. I think these bubbles are caused by the things which grow under and on the sand.